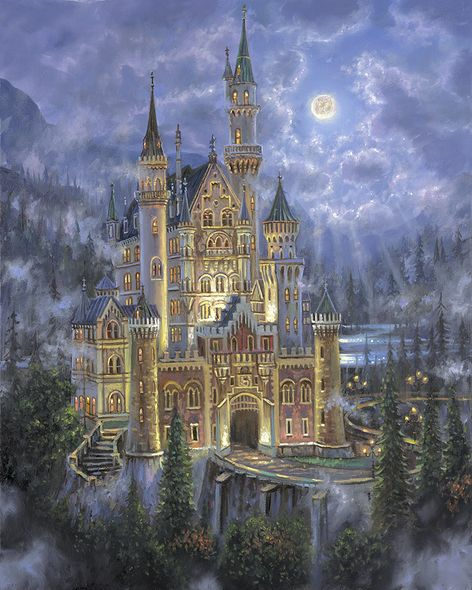 Robert Finale Artist Signed Limited Edition Sublimation on Metal:"Moonlit Castle - Color"
Edition: Artist Signed and Numbered, Limited to 300. Certificate Of Authenticity Included. About the Art : "A new 21st Century vibrant illumination, with incredible detail and depth, special art only cutting edge prints creation on metal can provide. This Sublimation on Metal is ready to take on the new age art world, providing what buyers are looking for, art for the home, art for corporate clients, a gift for that special occasion and more. For our first release of 2018 in this exciting new Sublimation on Metal Collection is "Moonlit Castle". Images in this unique art series have been designed & perfected by Robert Finale and Robert Finale Editions for Sublimation on Metal only. You will not see images released in this collection on canvas. We will keep our canvas releases separate for our collectors who want the exclusivity of the canvas collection they have come to love.